Safety Around Dogs – Pre-K, Kindergarten, 1st grade, 30-40 min. 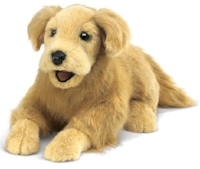 This interactive presentation uses photos and a very life-like puppet to teach children how to behave around dogs. Students get to practice the safe way to pet a dog and how to react when approached by a stray dog. Since dog bites are one of the leading causes of injury to children, this presentation is a must for all youngsters. Kindness to Animals – 2nd grade, 45 min. This fun presentation gives children a chance to think about the way they treat others, especially animals. Students must pick from a grab bag of mystery items and decide which would be kind to use. Students interact with a variety of stuffed companion animals to learn ways they can improve animals’ quality of life. City Wildlife – 3rd grade, 45 min. Students will love learning about some of their not so cuddly neighbors that they can find right in their own backyards. One lucky student gets “caught” and helps teach classmates why wild animals don’t make good pets. A short video, photos, and a variety of animal props show students how every wild animal has an important job that helps our planet. Pet Needs – 4th grade, 45 min. Students attempt to identify a variety of animal care props and learn how the items are used to properly care for an animal. They learn about what their pets need to be healthy and happy, as well as the importance of neutering. This presentation stresses why all pets should be treated as a member of the family. Preparing for a Pet – 5th grade, 45 min. Students learn about everything they need to consider before deciding to get a pet. They split into teams and love trying to guess all of the responsibilities involved in properly caring for an animal. This presentation stresses how much work, time and money are involved in being a pet guardian. Careers With Animals – 4th and 5th grade, 20 - 45 min. Children will be surprised to learn there are many more career options involving animals than they could have imagined. This presentation encourages students to think about subjects they enjoy, and then offers a variety of potential jobs involving animals that use these skills. This topic is available as a full presentation or can be modified for school Career Days. The Homeless Pet Crisis – 6th grade through high school, 45-60 min. Students will learn the facts about the animal overpopulation crisis and why animal shelters exist. This presentation focuses on three ways students can help prevent abandonment and overcrowding at shelters. A fun opportunity to act as “adoption counselors” teaches students the importance of choosing the right animal for their home. The Truth About Pit Bulls – 6th grade through high school and Adults, 45-60 min. This presentation focuses on clearing up the misinformation and fear surrounding pit bulls. We discuss the history of the American Pit Bull Terrier dating back to the early 1800s and the true breed standard of this wonderful dog. Students, teachers and adults walk away with a better understanding of how media bias and other factors have contributed to the bad rap these dogs suffer from. Responsible Pet Care – Adults, 45-60 min. This informative presentation expands on the basics of animal care in areas like diet, health and training. Adults will learn about puppy mills, the homeless pet crisis, and the importance of making a lifetime commitment to their pets. Presentations are done in the individual classrooms and not assembly style. We can perform a minimum of 2, and a maximum of 4 presentations per day. Therefore, if the school has a total of 20 classes, you would need to reserve a total of 5 days if all grades are interested in participating. Presentations are most effective when presented within a classroom setting. However, assembly style presentations can be accommodated for large groups if necessary. Teachers may book a presentation for one classroom, but 2 classes or more are always preferred. To make the most of our time and limited resources, booking a presentation for groups with less than 15 people will be dependent upon the group’s location and number of people in attendance.